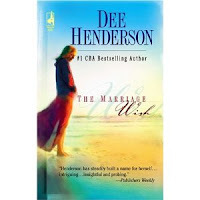 The Marriage Wish , a Christian fiction book by author Dee Henderson, is the 50th book I have read this year. It was a quick easy read, however the topics it deals with are difficult ones - death, guilt, loneliness, loss of faith, etc. I enjoyed the storyline about Scott Williams, a 38-year-old bachelor who makes a birthday wish to find a wife, and Jennifer St. James, a writer who is dealing with her grief and (unfounded) guilt over the death of her husband and infant daughter three years before. It is a true romance story although much of the story revolves around the difficult and sad events in Jennifer's life prior to her meeting Scott. However, the epilogue is truly a happy ending when it describes their life together five years later. Personally I thought the story moved too quickly and that the characters were not fully developed. For example, in chapter 1 the two have a chance meeting which prompts Scott to search for Jennifer and leave a message with her agent. By the end of the chapter, they are talking like they've known each other for years, even though Jennifer will keep some of the secrets of her past to herself for much of the book. Late in the book there is a devastating house fire, daring almost-rescue of an infant by Jennifer, rescue of Jennifer and the infant by Scott and others, Jennifer's recovery time in intensive care and change of heart about marriage - all in only five pages! However, as I researched a little about the book, I discovered that this was Dee Henderson's first book which was published in 1998. It is also the first of her books that I've read. Over the ensuing years, she has written numerous other books including the O'Mallory series. I will definitely read more of her work as I enjoy Christian fiction and enjoyed the storyline of this book. It will also be interesting to see how her writing has developed since this first book.